"Marriages are made in heaven” but they sometimes end up in hell too. As far as matrimonial entity is concerned, there was an era when only the men in the society would be so bold as to put across their feelings and give voice to their needs and yearnings. He would not be afraid to sound saucy, thereby adding gall and wormwood to his marital life. On the other hand, in order to nurture a serene conjugal life, the woman had to oscillate on the same frequency as that of her spouse. She was therefore enforced to make compromises to save the marriage from splitting. It is often suggested that truthful communication to make oneself understandable leads to mental peace and happy family build up. But how far is it true? When it comes to the men, what so ever he utters is or rather ought to be accepted. But when the women talk of their discontent, they are wrongly interpreted as ‘revolt and protests’. That is why even if the women talk about what’s happening in their marriage, they analyze it with self-delusion. Should the wives be honest about everything, - that would lead to a broken marriage? There are so many incidents to show that pretence and fallacy paves the path to a booming marriage. Being callously honest about everything would lead on to a day when she would become conscious of the fact that decay has set in life over an already dead relationship with her so-called ‘soul mate’. To keep ones marriage brimming, one has to ruse to oneself about all sorts of negative aspects and sow optimism in thoughts. Therefore, talking about everything doesn’t necessarily help. Compromise – the most important essential of a healthy marriage, usually came from the lady of the house, all these days. Generally the woman gave in with the expectation that circumstances would improve in future. Whether situations recover or not if with a smile on her face she survives in spite of all the pain and agony, insult and abhorrence… she is esteemed as an idol. But things have undergone metamorphosis with evolution of society. Metropolitan cities are seeing similar modification, as in the western world, where ‘divorce’, which was once supposed to be a fearful doom for women, is now looked upon and fought for as a civil right. Today marriage is less sacrosanct and divorce is no longer an ultimate vanquish. Today’s women has bid good-bye to their long-sufferings in the form of victims of marriages, - thereby only shedding silent tears in woe. Where lay the rationalization in lingering a dead relationship? If not others, but those two souls understand best, how unbearable and distressing is the ache, how such a rotten relationship stinks when only mere acting continues to camouflage the long-lost love between the couples. The socially bound people appreciate this yoked life, - filled with struggle to maintain this tattered relationship, but yet not completely torn apart. But if the disgusted soul has a propensity to choose to practice the right to freedom, they would not be spared of society’s criticism. Yet today’s divorcing couples don’t necessarily feel wrecked and humiliated and many women too look at the end of a bad marriage as a rejuvenating commencement. That indeed is a far cry from the time when divorcees were thought inauspicious and were shunned by the society. All these are increasingly becoming things of the past. Even the traditional middle class families are now increasingly acceding to the view that it is preferable to terminate the so called ‘sacred’ agreement, than be bound in an unsuccessful wedlock, only for the fear of society. 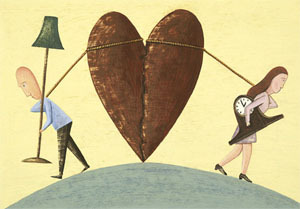 Splitting up is not always miserable as more and more people are getting lucky the second time. Modern thinkers point out that all this reflects the extensive empowerment of Indian women, who increasingly disallow to be duped and snared in an unpleasant condition. This is of course unpreventable in a developing society where the growing assertiveness in women is due to the rising literacy level and outstanding scholastic exhibit, leading onto a promising financially independent career, thereby blessing with emotional security. Resoluteness, fearlessness and overflowing self-confidence are the distinguishing personalities of the ‘new woman’. She has shown improvement in her capabilities, and has gained intelligence and confidence over the past years, and is now therefore in absolute control of her own life. She goes through pain but is now able to recover faster and is able to create a world of hr own. Competing dreams of achievements are therefore followed by long working hours which quite obviously diminishes the level of endurance, thereby taking a toll on her family life. Society’s perception about good and bad, acceptable and unacceptable is fast switching. Once the society was a matter of fear and pertain, which is no more relevant. Women of today seem to initiate a divorce when she feels no justification in continuing with an unsatisfactory relationship, only for the sake of answering to social queries. Thus marriage as a customary divine institution is increasingly losing its value.